A squirrel's weight on the perch closes the seed ports. Can be hung or pole mounted. Includes both pole and hanger. Absolutes now come with windows above the feeding stations. These clear, polycarbonate windows can't be damaged by squirrels. The feeders are also shipped in full-color packages with "natural-look" graphics, making them easily identifiable at point-of-purchase. 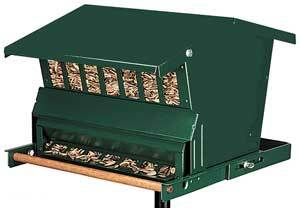 Feeders come in powder-coated forest green finish.